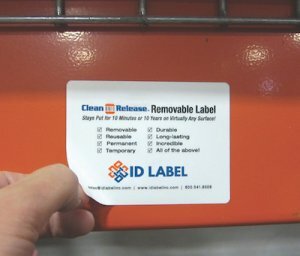 Uses for Clean Release™ Removable Warehouse Label | Blog | ID Label Inc.
Clean Release™ is a removable warehouse label that performs unlike any label we’ve ever manufactured. It features an advanced adhesive that adheres tightly to virtually any surface – but is easily removable and reusable without a hint of adhesive residue left behind. Clean Release™ is a new warehouse label that features an advanced adhesive that adheres tightly to virtually any surface – but is easily removable and reusable without a hint of adhesive residue left behind. With Clean Release™, you can easily remove and relabel locations and containers with new barcode data as your product inventory and information changes or when reconfiguring locations. And eliminate countless unproductive worker hours otherwise spent scraping off old labeling and repeatedly cleaning and treating your racks, beams, totes and shelves. Clean Release is an innovative, removable warehouse label. It stays securely in place yet is easy to remove and replace even years later. Metal warehouse racks, plastic totes, bins, shelves, PVC signs, forklifts, furniture, paper, wood, glass – you can use Clean Release on virtually any surface as a temporary or permanent labeling solution. It even performs in damp and cool environments. Clean Release was designed with today’s smart warehouse in mind, where speed, efficiency and inventory location flexibility are top priorities. Easily remove and relabel locations and containers with new barcode data as your product inventory and information changes. And eliminate countless unproductive worker hours otherwise spent scraping off old labeling and repeatedly cleaning and treating your racks, beams, totes and shelves. 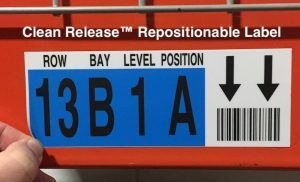 Removable, Repositionable – Advanced adhesive allows easy removal of barcode labels on warehouse racks, beams, shelves, bins and totes – even after years of use. No residue, torn labels or labor-intensive clean-up. Durable – Laminated coating adds long-lasting durability, ideal for rack locations and reusable totes. Temporary and Permanent – Use on virtually any surface as a temporary or permanent labeling solution. Multicolor Options – With ID Label’s new digital UV inkjet presses, custom labels can be produced in a multitude of colors, images and sizes, and packaged on rolls or sheets. Clean Release™ was a finalist for the 2018 MHI Innovation Award. MHI is an international trade association that has represented the material handling, logistics and supply chain industry since 1945. 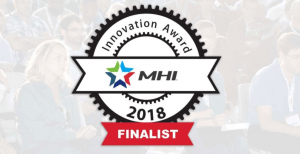 The MHI Innovation Award serves to educate and provide valuable insights on the latest manufacturing and supply chain products and services for MODEX attendees.